Over time Amazon's metric has been increasing, suggesting a decrease in Amazon's ability to forecast supply and demand. High inventory velocity is key for Amazon's growth, allowing it to collect from customers before it has to pay supplies. Days Payable Outstanding (DPO) is related to this. 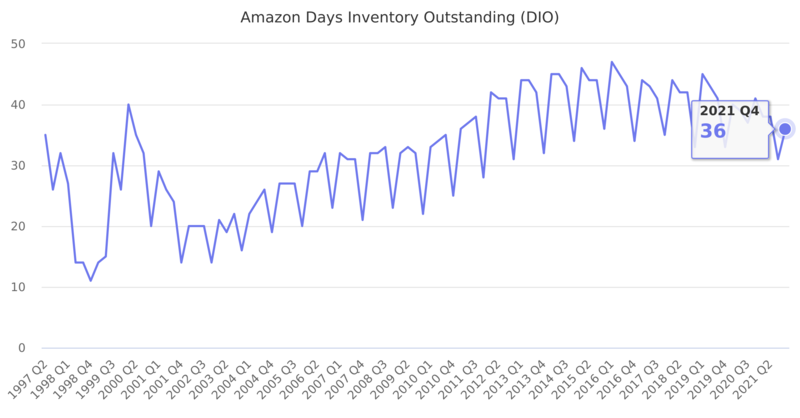 Days Inventory Outstanding (DIO) is a standard accounting metric, defined also as days sales of inventory, indicating how many days on average a company turns its inventory into sales. In general, a lower DIO is better. The formula to calculate DIO is written as: average inventory / (cost of sales/number of days). This is caculated based on ending Inventory for the current and previous quarter and Cost of Sales figures reported by Amazon. Last reported quarter 2018 Q3 it was 44.24, up by 6% year-over-year from 41.77.